Our rainbow bridles (now available in English and Western styles) are a big hit with customers, including Lottie and Kristy, winners of a recent giveaway we did on Facebook! Who would’ve thought you could get this unique of a piece for just $35?! Want to make your horse’s turnout a little more glamorous? We’ve got you covered. We’ve just added biothane glitter turnout halters to our shop! This halter is perfect for everyday use because biothane is industry tested for strength, even in the most rugged conditions. It’s also waterproof and fade-proof—just dunk in a bucket of soapy water after the horse has taken a roll in the mud and air dry. Our glitter biothane halters are here! The glitter biothane halter is adjustable at the nose and crown and comes with reinforced holes. Our glitter biothane halter is available in your choice of five colors (light blue, dark blue, green, purple) and no-rust stainless steel hardware comes standard. Note: At this time the glitter biothane halter is only available in horse size. Sorry for any inconvenience! We feel like when it comes to tack, our online shop has an awful lot of the things you need in your tack room (minus saddles)–halters, stirrup leathers, lead shanks, bridles, we’ve got ’em, and in so many hues you could make a rainbow out of them. The one thing we haven’t had before was a really good, durable, easy-clean saddle pad. We’re pleased to announce that we have begun carrying Equitech neoprene saddle pads, both Western and English. This is Equitech’s waffle board style pads, which are breathable to keep your horse cool even during a long ride. We’d searched high and low for a pad that would keep saddles in place without breaking the bank, and when we tried the Equitech pads we liked them (and their price) so much, we decided we needed them in our shop. Neoprene, like beta biothane, is water-proof, so you just need to hose it down after a ride to get it clean and germ-free. If you have a horse who sweats a lot in the summer, you’ll know what a blessing it is not to have to cart a bag of horse laundry home, untangle all the velcro straps, and scrape horse hair out of your washing machine…usually after your pad has shrunk in the wash and still has faint sweat stains on the bottom of it. Save yourself the drama! Try a neoprene pad. The English pads come in black and brown currently, and also shaped to fit trooper, treeless, and tucker style saddles. Western pads come in black, brown, pink, lime green, teal, orange, purple, and yellow. We’re constantly adding new items to our shop per customer requests. That’s why we’re happy to bring you a new, simpler type of breast collar. This one-piece breast collar (we’re calling it a “strap”) is a favorite among riders of gaited horses because it doesn’t interfere with the horse’s action. Instead of stabilizing the saddle with a strap running between the horse’s front legs to the girth, the breast strap buckles onto the D-rings or girth billet on either side of the saddle, and works extremely well to keep the saddle in place through a long ride. Buckle ends are standard with this piece, but snaps are optional, too. Either type of strap end is adjustable, allowing you to set the tightness of the strap’s hold against the horse. The breast strap is available in all 12 of our dazzling beta biothane colors. Of course, the horse’s neck and chest get sweaty during a long ride in the summer, which is why it’s so convenient to use beta biothane for breastcollars and straps–it just takes a quick trip through a bucket of soap and water to remove sweat and dirt from this super-strong material. What could be simpler? We’ve recently added a new item to our shop, but at first glance it’s hard to imagine what they might be used for. Hobbles have had several different uses since their origin in Ancient Egypt. The two loops of material (people have used metal, braided rope, and leather over the years) link a horse’s ankles together with some slack in between, limiting the animal’s range of motion. Some trail riders use these to allow horses or donkeys to free graze during a rest while preventing them from straying too far or too quickly. Some Western riders also use hobbles to desensitize horses to the feeling of equipment brushing around their ankles. A different, more heavily-padded type of hobble is used in breeding sheds to keep mares from kicking valuable stallions. These beta biothane hobbles are smooth on the surface but strong, making them a great option for keeping the tool in place without friction on the horses’ skin. Pick up your own pair of hobbles here. Tags: beta biothane hobbles, hobbles, horse hobbles, new products, what's that tack? Congratulations to the winner of our war bridle! 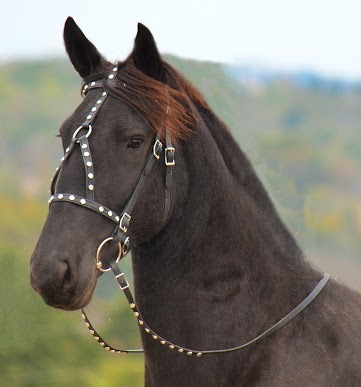 Congratulations to the winner of our war bridle giveaway contest, Shelley S. and her horse, Sweet William! “Will” is a 9-year-old Clydesdale/Missouri Fox Trotter mix. Shelley tells us Will is “a total pocket pony” with a great sense of humor. After breeding Will, Shelley developed serious health conditions which required her to begin walking with a cane or walker when Will was two years old. She was relieved to discover that unlike her other horses, Will was unafraid of her cane and allows her to lean on him on their walks to and from the pasture. We’re pleased to be able to outfit such a great companion with a fantastic new bridle. Congratulations, Shelley and Will! Who doesn’t love a good tack giveaway? To help introduce our medieval / war bridle, we’ve got a fantastic promotion. Besides our $10 off for 10 days promotion, which comes to an end on Monday, you can now enter to win your own custom war bridle and matching reins! Perhaps best of all there’s none of that pesky “Like our Facebook page and share this photo and tweet/fax/email everyone you’ve ever known about this” in order to enter. All you have to do is fill out the entry form here before Nov. 30 and you’re entered! Hint hint: This bridle makes an excellent Christmas gift…and the holidays are just around the corner. If the war bridle is a little too dramatic for your tastes, feel free to browse our other fantastic products. What’s the only thing better than a well-made piece of tack? A well-crafted piece of tack that’s on sale! Starting Friday through Monday, Nov. 25 our new war bridle will be $10 off. That’s 10 days of $10 savings, which we think is a great deal. The war bridle is perfect for parades, costumes, or just about any horse with a flair for the dramatic. This medieval-style bridle features a cross piece that runs down the forehead and splits in two before attaching to the top of the noseband, creating a “war horse” affect that really turns heads. Like all of our bridles, the baroque bridle is fully adjustable ensuring a comfortable fit for any size of horse. The noseband & throatlatch are adjustable on both sides. The cheek pieces of bridle are adjustable on top as well as by bit. The faceplate is adjustable at top of crown piece. Best of all, beta biothane is guaranteed not to crack, fade, or rot, and only needs a trip through the dishwasher or under the hose to come as clean as the day it arrived. We also offer the war bridle with bling, or in leather for you traditionalists. The beta bridle comes in one- or two-color styles in a range of colors to be as flashy or discrete as the occasion requires. Check it out here.